This will be a spoilery review. I’ll try not to go into big details, but what I have to say relates to the plot, so I can’t help it, sorry! I’ll do my best to keep it at a spoiler minimum, but just in case you’ll hate me for ruining your read with details, just, I dunno. Ignore this? Lol. Basically, the first half of this novel read like Sookie filler to me. We keep watching her as she does the most boring things I can imagine, and even though the pace of things picks up a bit into the second half of the read, she keeps trying her best to kill off the excitement. I’m not sure why. She’s all gloomy and boring, with a few moments of her usual humor. But overall, she’s just not fun anymore. The plot is not fun anymore, the characters including Eric in this novel, everything just seems to not be fun anymore to me, not comparing everything to previous books in the series. Is this a read I liked? Sure. But I used to love these novels, not just like them. Sigh. I’ve been waiting for this book for a year, twitching with excitement and wondering about what Eric will l do and what choice he’ll make. Surprise! He’s almost not in the novel, I mean he makes some brief appearances then fluffs away. And when he is in the picture, he’s not quite…Eric-y enough. I’m not sure what, I can’t put my finger on it, but there’s something about Eric that just doesn’t feel right in the last couple of novels. And the fact that this whole novel manages to somehow dance around the Eric and Sookie situation for the better part of it, and leave it hanging in the end is sort of odd. Too little of Pam and Eric here, simply too little. More fay and such, which was cool, although that little chapter of Sookie’s life sort of closes at some point. Maybe the supes will all get out of her life, group by group. I think this sets the stage for her to quit on vamps in the last book. Maybe it’ll be something dramatic and emotional, or a choice she makes or something, but that’s the vibe I got. Like this book is setting up the stage so she’d stick with a shifter maybe, since they’re not as thought-intense as regular people. Maybe she hooks up with Quinn again, there’s got to be a reason he calls her for her birthday in this novel. And his mom and sister’s situation seems to have been solved, so…who knows? Don’t know, don’t much care. I just wanna know what happens to Eric and Pam. And if they get keeled over I’ll have a fit. I’m going to read the next novel, just because I’m curious. 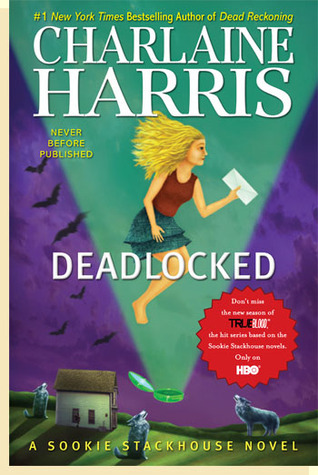 But all things considered, when I’ll want some Sookie Stackhouse novels fun time, I’ll just go through the series from the start. Possibly stop at #9, where Eric still feels like Eric to me, and everything is active, alert and fun. All in all, this was a pleasant read, though not as fun as previous books in the series. If you’re Team Eric though, you could almost skip it. Let’s hope the next one will end the series decently and without viking death. I think I’m inclined to finish the series when they are all written. They aren’t really good enough to keep waiting in anticipating anymore. Yeah, I know what you mean. I couldn’t resist reading a couple of them once I saw True Blood, I was too curious about my character crush, Eric 😀 And then, being the maniac that I am, I read them all of course. There’s one book to go, but I’m not really anticipating it much. I was really disappointed in this one, to be honest, and I noticed they’ve been getting less exciting as the series progressed. You know how it is with some series, sometimes they just reach that point when they feel close to the end, all plausible leads were explored, all angles feel already explored. While reading this book, I felt like the series is going to die out naturally, you know? Not that it’s gonna be killed prematurely for whatever reason, but that it has run its course. Meh. I’m just sad I won’t get any more Eric, he’s freaking awesome. I’ll just re-read the first 8 or 9 books in the series when I miss him, I guess, haha.